In today’s society, we rely heavily on our phones and take them with us wherever we go. On top of that, there are so many apps created to help us in our everyday lives and keep us close to our loved ones. In 2014, hearing aid technology that could be integrated to your iPhone became they newest technological advancement in hearing aids. Since then, these apps have only gotten more efficient and helpful for all hearing aid users; allowing you to do anything from a quick change in hearing aid settings to checking your battery status all from the convenience of your smartphone. These apps are separated into two categories – those that require the use of an intermediate device, such as a streamer, to function, and those that do not and can work directly from your phone to your hearing aids. 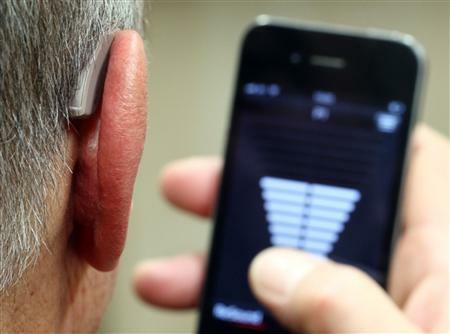 Those that require an additional accessory are becoming less common as manufacturers begin to roll out “Made-for-iPhone” hearing aids. Not only will these apps help you get the most out of your hearing aids at any time, they can also help you feel more in control and have a greater understanding of your hearing aids. 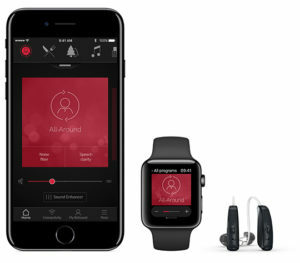 In order to connect your Made-for-iPhone hearing aid with your iPhone, you must ensure that Bluetooth is on for both devices. Once they are paired, you will be able to hear the audio from your device directly from your hearing aids. Popular Made-for-iPhone hearing aids include; Bernafon Zerena, Oticon Opn, ReSound ENZO and LiNX, Signia Pure BT, Starkey Halo, and Widex Beyond. Signia touchControl: turn your mobile phone into your Signia remote. Not only will you have complete control over your hearing aids at your fingertips, but no one will even know that that is what you are doing. Compatible with various Signia/Siemens hearing aids, this app is perfect for those who wish to keep their hearing loss as discreet as possible. Oticon ON: compatible with the Oticon Opn and other Oticon wireless hearing aids, this app allows you to connect your hearing aid with various other devices and services. Use this app in conjunction with the internet service IFTTT to connect your hearing aids with your home appliances, phone, email, or doorbell. 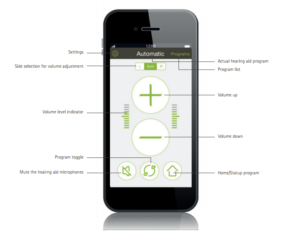 You can also change the volume and program of your hearing aids with this app. ReSound Smart: allows you to control and personalise your hearing aid settings including; adjust volume, mute, adjust speech focus or comfort in noise, change streamer programs, adjust treble and bass, and adjust the sound and frequency of the Tinnitus Sound Generator. It is compatible with all ReSound Smart hearing aids. Phonak Guide App: an app to help you get used to your Phonak hearing aids. This app is perfect for new time hearing aid users as it provides tips on handling and maintenance for your hearing aids through illustrations and user-friendly language. Instructions include how to change your battery, turning it on/off, inserting and removing the device, and cleaning. It is supported by most Phonak hearing aids, making it a must for all Phonak users. Starkey TruLink: connects your Made-for-iPhone Starkey hearing aids to your iPhone. You can use this app to stream your phone calls, music, videos, FaceTime, Siri directly to your hearing aids via Bluetooth. Using the SoundSpace and TruLink Memories features, you can adjust sound settings in accordance with your environment and save these settings for when you visit the location again using “geotag” memory and the iPhone’s built-in GPS. There is also a Find My Hearing Aids feature that you can use for when you seem to misplace your hearing aids. Signia myControl: compatible with the Signia Pure and Motion 13 BT, this app works as a remote control that allows you to make seamless changes to your volume and program settings, while also allowing further personalisation through the adjustments of treble and bass, and microphone directionality. This app also allows you to view your daily sound exposure to prevent any further hearing loss. Widex BEYOND: compatible with the Widex BEYOND hearing aids, this app allows you to stream and control your hearing aid. Other features include adjusting directional focus, creating personal programs, adding locations to your programs for automatic adjustment when you return, and troubleshooting tips. Signia miniTek Remote App: converts your Android smartphone into a discreet remote control for your Signia hearing aids and miniTek. With this app, you can make adjustments to your hearing aids, or connect them with audio devices such as your television, MP3 player, or laptop. Phonak RemoteControl: compatible with the Phonak Venture and Belong hearing aids, this app must be used in conjunction with the Phonak ComPilot II or ComPilot Air II streamer. It allows you to adjust the volume and program of your hearing aid, as well as stream directly through your hearing aids. ReSound Control: this app allows you to make adjustments for your hearing aids through your smartphone. These adjustments include volume, programs, or to control other streaming devices such as the ReSound TV Streamer 2. This app is compatible with most ReSound hearing aids, and a perfect option for those who desire discreetness when adjusting your hearing aid, or for those who do not like the small controls on the hearing aid. Bernafon EasyControl-A: compatible with the Bernafon Zerena, this app allows you to discreetly adjust the volume, change programs, and view the battery status of your hearing aids. You can also use the “Find My Hearing Aid” feature, find user instructions, control tinnitus relief sounds, and connect to the IFTTT service. ReSound Relief: a hearing aid app that does not require a hearing aid, the ReSound Relief app is invaluable for those who suffer from tinnitus. With this app, you can manage your library of sound therapy files, as well as create your own soundscapes using environmental sounds and music. If you have ReSound wireless hearing aids, you can stream directly through them. Oticon ConnectLine App: requiring the Oticon Streamer Pro as an intermediate device, this app combines a remote control for your hearing aids with the ConnectLine system. It allows you to connect wirelessly to your mobile phone, remote microphone, and television. Bernafon SoundGate: used with the Bernafon SoundGate 3 Bluetooth streamer, this app will allow you to switch programs, adjust the volume, and connect your hearing aid to multiple devices for streaming. There are other apps currently on the market that are exclusive to specific hearing aids or that require specific streaming devices. While apps are not a necessity for all hearing aid users, it definitely makes your life easier and more convenient. Regarding Android apps, almost all apps that are available in iOS are also available in Android. However, streaming without an intermediate accessory is only available with the Phonak Audeo B Direct, and not all apps are compatible for all Android devices. Check the app to see if it is compatible with your device and hearing aid. Contact us on 1300 848 335 today for a free, no obligation consultation with one of our qualified consultants.